When the Economy Collapses, What is “Money”? It seems like every year there is talk of an imminent economic collapse. 2017 is no different. With the economic deck stacked against Trump, I don’t have much confidence that he, alone, can turn things around. After all, the national debt is completely out of control and has doubled in the past 8 years. Sooner or later, the piper must be paid and preppers who breathed a sigh of relief when Trump was elected, may want to think again, as I wrote about in this article. What is money when the system collapses and the SHTF? 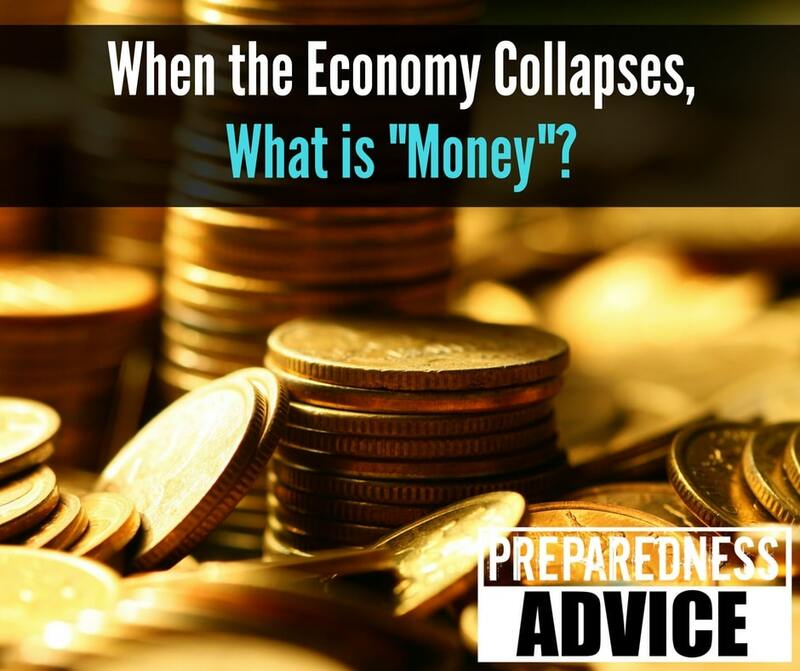 In disaster situations, the value of money as we know it now, changes, especially if we are dealing with a hyperinflationary collapse of the system’s core currency. This article discusses money as a commodity in an event where the traditional currency (US Dollar) is no longer valuable. In a collapse of the system, there will be multiple phases, with the first phase being the “crunch”, as discussed in James Rawles’ book Patriots. The crunch is the period of time directly preceding a collapse and the collapse itself. Too often, preppers prep for “the crunch” and fail to realize they will have to be ready to survive for many months, if not years afterwards. Initially, the traditional currency system will maintain some value, though it may be rapidly depreciating in buying power. For those with physical, non-precious metal denominated currency on hand (paper dollars, non-silver coins), spending it as rapidly as possible is the best approach. In Argentina during that country’s many economic collapses, if someone received a check in payment, the immediately rushed to cash it, knowing that it was losing its value minute by minute. This short Kindle document, written by a survivor of that time in Argentina’s history, details that event. It is during the crunch that ATM machines around the country will run out of currency as people aware of the rapidly devaluing dollar will be attempting to withdraw as much money as possible. This immediate increase in money supply, coupled with the population’s general knowledge of the currency depreciation in progress, will lead to instant price increases for goods, especially essential goods. And, forget the classic “run on banks” that have been depicted in old movies, including “It’s a Wonderful Life.” A modern day “run” simply won’t happen. Rather, the electronic system that moves money from a billion different points to another billion points will simply be turned off. In a split second, all access to funds will cease, and there will be no point running to a bank to get cash, since banks will be in lockdown mode and, in any case, they hold very little actual cash. If your physical cash has not been converted into tangible assets, this would be the time to do so. Acquiring as much food, fuel, clothing and toiletry items as possible would be the ideal way to spend remaining cash before it completely collapses to zero, as it did in the Weimar inflation in 1930’s Germany or Zimbabwe’s hyperinflation in recent years. This family survival and prepping manual has in depth advice for preppers at all stages. During the initial phase of the ‘crunch’, precious metals will be a primary bartering tool, but this may not last long. The old survivalist adage, “You can’t eat your gold,” will become apparent very quickly. In a total breakdown of the system, food, water and fuel will be the most important tangible goods to acquire, and for beginners, this list of where to start with food storage is invaluable. Consider someone who has a two-week or one-month supply of food on hand. Do you believe they would be willing to part with that food for some precious metals? The likely answer is no. There will be almost no bartering item that one would be willing to trade their food for once it is realized that food supply lines have been cut. At that point, it’s anyone’s guess as to when supplies, food and otherwise, will be replenished. That being said, since most will not barter their food, not even for fuel, the next recognized medium of exchange by merchants, especially those selling fuel, will be precious metals. For the initial crunch, silver coins, especially recognizable coins like 90% silver quarters, dimes and half dollars, along with one ounce government mint issued silver coins, like US Silver Eagles, will be accepted by some, probably most, merchants. For those trying to flee cities to bug-out locations, silver coins of the aforementioned denominations may be a life saver, as they can be used to acquire fuel. While it’s recommended to have gold as well, the issue with gold is that its value is so much higher than that of silver. Breaking a one-ounce gold coin into ten pieces just to buy a tank of gas will not be practical. It is for this reason that having silver on hand is highly recommended. Packing at least $25 – $50 worth of silver coins in each bug-out bag would be a prudent prepping idea. In a total SHTF scenario, silver and gold may eventually break down as a bartering unit, as contact with the, “outside” world breaks down. One reason for this, is that the fair value price of precious metals will be hard to determine, as it will be difficult to locate buyers for this commodity. As well, the vast majority of people will not have precious metals of any kind for barter, so other forms of currency will begin to appear. This, however, does not mean that you should spend all of your precious metals right at the onset of a collapse. Precious metals will have value after bartering and trade is reestablished and once the system begins to stabilize. Once stabilization begins, the likely scenario is that precious metals will be one of the most valuable monetary units available, so having plenty may be quite a benefit. At this point, they could be used to purchase property, livestock, services, and labor. Water is often overlooked as a medium of exchange, though it is one of the most essential commodities for survival on the planet. An easy solution for providing yourself and others with clean water is to acquire a portable water filtration unit for your bug-out bag(s). While they are a bit costly, with a good unit such as the Katadyn Combi water filter running around $170, the water produced will be worth its weight in gold, almost literally. This particular filter produces 13,000 gallons of clean water! It’s a must-have for any survival kit. Because we like reserves for our reserves, we’d also recommend acquiring water treatment tablets like the EPA approved Katadyn Micropur tabs. If your filter is lost or breaks for whatever reason, each tablet can filter 1 liter of water. In our opinion, it’s the best chemical water treatment available. Clean water is money. In a bartering environment, especially before individuals have had time to establish water sources, this will be an extremely valuable medium of exchange and will have more buying power than even silver or gold on the individual bartering level. In a system collapse, food will be another of the core essential items that individuals will want to acquire. Survival Blog founder James Rawles suggests storing food for 1) personal use, 2) charity, and 3) bartering. Dry goods, canned goods, and freeze dried foods can be used for bartering, but only if you have enought to feed yourself, family and friends. They should be bartered by expiration date, with those foods with the expiration dates farthest out being the last to be traded. You don’t know how long the crunch and recovery periods will last, so hold the foods with the longest expiration dates in your posession if you get to a point where you must trade. Baby formula will also be a highly valued item in a SHTF scenario, so whether you have young children or not, it may not be a bad idea to stockpile a one or two weeks supply. (For parents of young children, this should be the absolute first thing you should be stockpiling!). In addition to water, baby formula may be one of the most precious of all monetary commodities. Another tradeable food good would be non-hybrid produce seeds, but the need for these may not be apparent to most at the initial onset of a collapse, though having extra seeds in your bug-out location may come in handy later. If you currently have a productive garden, check out these instructions for creating your own mini seed banks for barter or sale. Fuel, including gas, diesel, propane and kerosene will all become barterable goods in a collapse, with gas being the primary of these energy monetary units during the crunch as individuals flee cities. For most, stockpiling large quantities will be impractical, so for those individuals who prepared, they may only have 20 – 50 gallons in their possession as they are leaving their homes. If you are near your final bug-out destination, and you must acquire food, water or firearms, fuel may be a good medium of exchange, especially for those that have extra food stuffs they are willing to trade. Though we do not recommend expending your fuel, if you are left with no choice, then food, water and clothing may take precedence. For those with the ability to do so, store fuel in underground tanks on your property for later use and trading, and this article provides vital instructions for storing fuel safely — a major consideration. Though firearms and ammunition may not be something you want to give up, those without them will be willing to trade some of their food, precious metals, fuel and water for personal security. If the system collapses, there will likely be pandemonium, and those without a way to protect themselves will be sitting ducks to thieves, predators, and gangs. Even if you choose not to trade your firearms and ammo during the onset of a collapse, these items will be valuable later. As food supplies diminish, those without firearms will want to acquire them so they can hunt for food. Those with firearms may very well be running low on ammunition and will be willing to trade for any of the aforementioned items. In James Rawles’ Patriots and William Forstchen’s One Second After, ammunition was the primary trading good during the recovery and stabilization periods, where it was traded for food, clothing, shoes, livestock, precious metals, and fuel. We may take it for granted now because of the seemingly endless supply, but clothing and footwear items will be critical in both, the crunch and the phases after it. Having an extra pair of boots, a jacket, socks, underwear and sweaters can be an excellent way to acquire other essential items in a trade. As children grow out of their clothes, rather than throwing them away, they will become barterable goods, and one possible way to earn an income during this time could be running a second hand clothing store. It is recommended that those with children stock up on essential clothing items like socks, underwear and winter-wear that is sized a year or two ahead of your child’s age. The above monetary units are essential goods that will be helpful for bartering in the initial phases of a collapse in the system. As the crunch wanes and recovery and stabilization begin to take over, other commodities will become tradeable goods. Another important monetary commodity after the crunch will be trade skills. If you know how to fish, machine tools, hunt, sew, fix and operate radioes, fix cars, manufacture shoes, or grow food, you’ll have some very important skills during the recovery period. It costs very little, if anything, to acquire skills and survival knowledge, and, in the worst of times, those are things that cannot be taken from you. Guest post by Mac Slavo from SHTFplan, updated by Noah, 1/2/17. Space Blankets, are They Good or Bad? Making Fire Under Adverse Conditions can be Critical to Survival. This entry was posted in SHTF, survival and tagged collapse, currency, food storage, fuel, Gold, precious metals, SHTF, silver, TEOTWAWKI, water. Bookmark the permalink. 14 Responses to When the Economy Collapses, What is “Money”? Spices especially salt will be a very good barter item. Roman soldiers were paid in salt at one time and other spices were huge trade items. this is what Columbus was looking for when he sailed. In 1972, I was in the military and was stationed out West. I was dating a LDS gal. One night she had me go to church with her to hear a speaker. He was talking about this very subject. He said salt, aspirin, and bullets. You need salt to preserve meat. Pure aspirin can be gotten from the vet supply for $6.00 a pound. It is anti-fungal. Acne and athlete’s foot medicine is aspirin. Since then added honey and fertilizer. Pure honey will keep 3000 years. Honey is good for many things including wounds. Fertilizer in plastic buckets will keep a long time. I’ve never understood the idea of providing someone with a weapon & ammo. Once they have that they can take everything else you have. It wouldn’t be my personal recommendation but when you’re listing different forms of currency, ammo would be on the list. Now, whether or not an individual wants to utilize it would be their personal decision. I would never trade ammo or weapons to a stranger. However, if I knew the person and trusted them, then it would be a different situation. It might be a neighbor you have known for a long time who needs ammo to defend his part of the neighborhood. I would consider a trade of ammo for ammo if I was low on one and had a lot more of the other. If you are in a small town – trading with neighbors you have known for a while would be a lot different than trading with someone you have never met before. I agree with the author on the importance and value of water! I have a multi-layered approach that includes stored drinking water in 1-gallon jugs that can be used or traded. I also like these stack-able 5 gallon water box kits (http://beprepared.com/100-gallon-boxed-water-kit.html), that are nice to have filled for home storage, while keeping some empty to take to go (in your vehicle), as you find water sources along the way… think light-weight and limited space usage. For bugging in, I also keep empty laundry detergent bottles, filled with tap water, that have residual soap remaining in them. They are to be used for cleaning/sanitary needs. For bug out bag purposes, I have multiple lightweight filters with interchangeable connectors. I like Platypus filters/bladders for our packs. Along with a couple of family size bladders, we have a Platypus gravity filter. As longtime campers/backpackers, we’ve come to appreciate using gravity instead of pump filters… why expend more energy (pumping) than necessary? Each family member has Platypus bladders in their pack, which also fit the same gravity filter. Each member also has individual filters (Sawyer Mini) that happen to also fit the Platypus system. These are inexpensive (about $20 each), and promise more gallons filtered than much more expensive ones on the market. I’ve discovered that the female screw on end of the filter (dirty water inflow) also fits Smart Water (brand) bottles. This solves my only complaint about the Sawyer minis – that the squeeze bag for dirty water is too hard to fill from a creek or lake. So the above water bottles, emptied, work better to dip in/fill for connection to the filter. All of these products are available from multiple retail outlets. Lastly, I’ve come across a great and inexpensive filter system for bug in, or vehicle bug out, using two 5-gallon buckets – one for dirty water, stacked above the other below for clean water, again – using gravity. It’s available from Monolithic Domes (http://www.monolithic.org/water-filters), who specializes in dome building structures, but also has this nifty dome-shaped water filter, used around the world where there is limited or no water purification. You can buy just the filter, with instructions to use your own buckets, or buy a complete system with pre-drilled buckets. While most filters on the market only remove bacteria (including the ones I mentioned for our packs), Monolithic claims that theirs also filters viruses. In the U.S., we don’t need to worry too much about viruses in water, just bacteria. However, that could become a more serious problem with a complete breakdown of our regional/national infrastructure. Worst case, boiling or distilling water should remove both bacteria and viruses. I suggest researching how to distill water, if you don’t know how. If you live anywhere near salt-water (non-potable), this skill could be critical. I’ve researched this fairly well. I’m not an expert by any means but who is? All of things listed so far will have their value to someone but not everyone. “Money” as such will turn to trade to what each party finds important. The #1 item that keeps pushing it’s way up the ladder is alcohol. Either home mode or manufactured ends up a common denominator. I am not a drinker but I know plenty of people who are and are more receptive to an exchange of just about anything for alcohol. Just something to keep in mind. Alcohol is a fine antiseptic and a moderate pain killer when nothing else is available. Try to show I’m wrong! Not sure why you’re so riled up. The article mentions skills and knowledge. According to my Money and Banking professor at the University of Southern California in 1960: Money are those things with a fixed price, defined in the unit of account, which are spendable. I was in Law Enforcement. I suggest using firearms solely as a defensive measure. If you have more than 1 firearm, you could allow your neighbors to borrow them to defend your neighborhood. It is easy to say that you would never trade ammunition or guns to someone you don’t know; but when you are hungry or thirsty, you just may do something that you would never do in normal times. That last sentence says it all. Few in the U.S. have any realistic concept of what they would or would not do if totally desperate. In many parts of the world, families resort to selling their own children in order to stay alive. Not so long ago in Bosnia, some resorted to eating human flesh. When know-it-alls come around, purporting to have all the survival answers, I’m not impressed because 99% of them have never been tested. Taking a class from Cody Lundin doesn’t count. You said a mouthful, Noah! During WWII, when infrastructure had been destroyed, and food and water were almost non existent, otherwise religious, moral people turned to cannibalism, and would sell their bodies, or those of their children, for a moldy crust of bread. These things were really done, and told to me by soldiers who had seen them happen in person! Starving people will do anything for food!